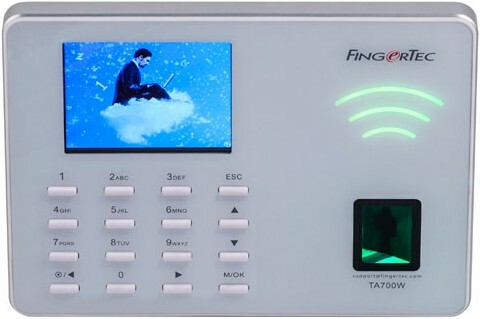 Keep it simple with the Fingertec TA700W, an elegant biometric time clock with WiFi capability. The TA700W is designed to be the most user friendly, convenient and efficient time and attendance device for small and medium sized businesses and organisations. Forget about messy wires and punch cards, simply scan your fingerprint and be on your way. Restore honesty to your workforce with the TA700W biometric time clock. Since no two fingerprints are alike, buddy punching is completely eliminated. The TA700W comes with a full colour TFT screen for appealing display of your company logo, a screen saver and more. With Live ID scanner, the TA700W has an improved scanning ability that can even detect blurry fingerprints; taking data integrity to new heights. Do away with wires, cables and paper. The TA700W has built-in WiFi for automatic wireless transactions; the automation gets rid of paper trails altogether. The compact TA700W comes with advanced technology and useful features at an amazingly affordable price. The TA700W is easy to operate - connect it to the power source and it's ready to roll! WiFi network connection and USB Flash disk are available for your choice of connectivity. The TA700W gives you a variety of verification options such as fingerprint, password (PIN) or a combination of both, providing the security and versatility you need. Made from robust materials, the TA700W can withstand wear and tear for years to come and it comes with 3 years limited warranty. The TA700W can store up to 1,000 fingerprints and 50,000 transaction logs, more than sufficient for your office requirements. If you are looking for an affordable, reliable and simple biometrics time attendance clock, the TA500 is your ultimate choice.